Is the Nokia Lumia 920 going to do for Windows Phone 8 what the Motorola DROID did for Android? Back on November 5th, 2009, Verizon launched the Motorola DROID and the first smartphone to be powered by Android 2.0 quickly changed history. Named the Time Magazine Gadget of the Year for 2009 even though it had been in the market less than 2 months, demand for the DROID kickstarted the Android platform which soon grew to be the largest mobile OS in the world. It is hard to believe, but by May 2010, 6 months after the DROID had been released, iOS had 40% of the global smartphone market while Android owned 26%. Things sure are a lot different today. The latest data for the U.S. alone showed that for the three months ended in November, 53.7% of the smartphone market in the country belonged to Android while 35% was claimed by iOS. Microsoft was hoping that one of the Windows Phone 8 handsets that it launched late last year could replicate the success of the Motorola DROID. With BlackBerry 10 set to be introduced before the end of this month, Microsoft has a lot at stake right here and right now. The good news is that the Nokia Lumia 920 is beginning to take off globally. In China, the Nokia Store in Shanghai was twice surrounded by long lines of customers looking to buy the Nokia Lumia 920. 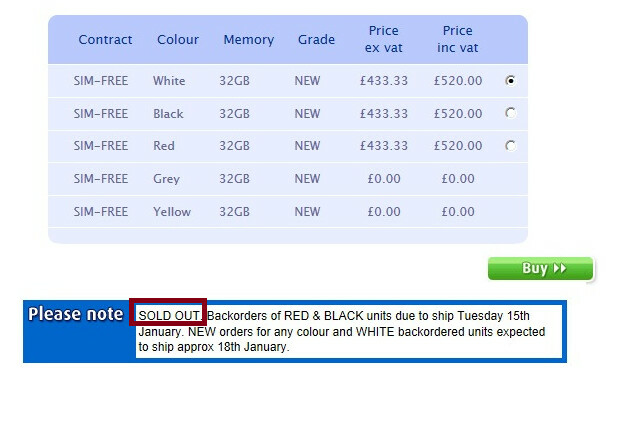 The second time, the yellow variant of the phone sold out in 20 minutes. Another example of the strong demand for Nokia's flagship Windows Phone 8 device comes from U.K. retailer Clove. For the third time, the device sold out from pre-orders placed with Clove even before the phones were received at the store. The shipment will now be sent out next week. 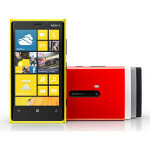 According to Clove's website, backordered red and black models of the Nokia Lumia 920 will ship this coming Tuesday. New orders and backorders placed for the white variant will ship next Friday. In the U.S., billionaire Mark Cuban gave a great endorsement of the Nokia Lumia line by saying that it crushed the Apple iPhone 5 which is why he switched. Actually, while Cuban didn't mention the Nokia Lumia 920 specifically, we're pretty sure that it was the model he had, After all, when you are that wealthy, you typically buy yourself the top of the line for everything. Maybe a phenomena like Androidmania comes only once in a lifetime, or just maybe the demand for the Nokia Lumia 920 starts to spread through out the Windows Phone 8 ecosystem. Regardless of how this all plays out, the Nokia Lumia 920 certainly has proven itself to be worthy of being a flagship smartphone. Nokia sure showed the other OEMs how to do the hardware side of things. Am sure they can dominate any platform they adopt. i agree with you, and add that sony also showed how to do the hardware side of things. They are fighting in a battle of ecosystem as they repeatedly declare. Just switch, WP is a better OS with a better foundation. Android only hide their performance through specs. the best definition for android yet! Please specify what makes Windows better than any other OS and please be very specific. Im going to come back and I better not see some comment about tiles that makes Windows mobile the best OS in the world. I will be waiting. Instead of people trolling and giving me a thumbs down. Answer the question, and make some valid points. Step up to the plate. 1. Not easier. Simpler. Less customizable. Remember, on Android you make it how you want it. This would make Apple KING! 2. Thats like saying Google+ is better. All preference. 3. Really? Android has office / pdf readers, etc. 4. How does that make windows better? 5. Stability? BE SPECIFIC. Android is very stable. Some phones arent. Has nothing to do with the OS. It would he like if the Nokia was stable and HTC wasnt. 6. There adware on you home screen bro! You still have not said one single thing that makes Windows better. I forgot to add that Apple is very stable too..
Im not being BIAS. Im taking Apple, Android, and Windows into consideration. I havent said one is better than one or the other. Im simply proving a point that Android and Windows currently offer the same things and it all comes down to user preference. I AM NOT TALKING PHONES! Im talking PURE OS. The only problem I see with Apple is their UI. Android and Windows currently offer live updates through widgets and tiles and iOS does not. Android can also run more apps at once even video while you do something else. Windows has good camera software. Each has their miniscule perks, but it all comes down to WHAT YOU WANT and need. Android is good if not excellent. Windows Phone is also good and it's still early to say what it can grow into. Look at early Android versions and look at it now. Windows phone will also grow. Keep up with your Android. Let others explore as well. You may think WP as no good but others don't see it that way. Perhaps they just want a phone with easy to hit buttons or tiles. "Android has office / pdf readers, etc. " but nothing even close to office "Android is very stable. Some phones arent. Has nothing to do with the OS. It would he like if the Nokia was stable and HTC wasnt" all phones in windows ecosystem are stable its not brand or model specific like android..everyone gets the same user experience. "There adware on you home screen bro! " Seems like its in your head. "You still have not said one single thing that makes Windows better." State what makes your android better..? Nothing close to office? We have a great word processing system and readers. Youre really tripping out if you think Windows is better its really the same thing. How many phones currently run windows? I hope that was a joke. Sure its smooth, but theres really nothing too extensive for it to stress out the phone because the windows OS does less. What part of that dont you understand? Theres over a hundred of Android phones. Some apps that run on a GS3 wont run on the original droid. Again, that has to do with the phones NOT the OS. Windows is too new to see anything yet. Same thing happened with iPhone and the original phone. Its obvious. Windows live tiles resemble ad like looks with Fb, twitter, etc... Also, The only ads are on the apps which are usually free! Well the better things on Android... 1. Rooting. 2. A hell lot more customizable. Stock 3. More free app options (expense of ads) 4. Can run more at the same time including Video! Seperate window. 5. Each manufacturer can add their own skin on top of the OS. So you have more freedom to choose exactly what you want. 6. With my use of Microsoft devices in the past, they might require paid usage for some of their services. I didnt say Android was superior. There are some advantages to both OS. The thing I like about Windows is that Microsoft sets a low spec limit. So they can not make a extremely low spec phone. It has to meet minimum requirements. One thing I very much dislike is that they do not fully support coparable devices comparable to the high end android phones as far as specs go. That limits developers from being able to develop apps that require a lot of power and that may be why it may feel smoother. In reality, it may be that the apps are too basic right now. You must have never used Android because Androids widgets display information like live tiles wayyyy before Windows mobile. You didnt know that? Nothing at all. Android need an 8 core phone to match the smoothness of a dual core WP8. I know you won't accept this and brag about jellybean being much smoother now. But smoother means neither "Smoothest" nor "Lag free". But I can give you one simple test to prove the fact. A very simple task. 01) Get a WP8 and get a Nexus 4 (because we all know stock stock android is faster than bloatware skinned Androids like Touchwiz, Sense, etc., 02) Restart both devices (To ensure WP has no advantages) 03) Tap the caller icon on "Nexus 4" and caller tile on "WP8" 04) See which one is faster to show up dialler screen first. 05) You can do other tasks too, like opening message hub. But don't open "contacts" on nexus 4 and "people hub" in WP8. Because you will be even more disappointed to show how quick WP is. NOTE: If you used a flagship like "Note 2", "DNA", "Galaxy S3" or "HTC One X+" instead of Nexus 4, the results will be even badder for you. I own HTC One S, but I adore WP. It's so smooth that android can only dream. Because android's every new version is going heavy. That's why a two year old phone can't even get updated to newer version, EVEN THOUGH THEY ARE ALL RUNNING BASED ON SAME KERNEL. I will be happy, if Google concentrate on optimizing Android rather than going heavy with the next major build. Because if google continue to do what they do now, then next year or in 2014, only quad core phones with 2 GB RAM, will be able to get the update. For example, just look at APPLE. All the iOS versions are based on same kernel, but almost all of their devices are running the latest version of iOS. That's what called optimization. Do you understand how technology works? Im going to use a TV for example. Older TVs were indeed faster than the newer TVs, but it takes time to process the image, etc... and bring it to you in better quality. So, can you assume why the Nokia Lumia 920 has a higher frame rate? Why the iPhone can process faster. I remember when the Droid Incredible came out and people were complaining of the frame rate even though it was one of the best phones at the time. Its really self explanatory why some stuff in Windows is faster. I really shouldnt need to explain that. Android runs a lot more at once and it can handle A LOT more at once. Also, the videos are so moronic not to go into developer options... I can make my GS3 open up pages a hell of a lot faster. Its in my settings. I have the choice to choose how fast my windows transition. This is without rooting or modifications. You are a downright idiot. You have no idea what you are talking about? You are desperately searching for your own ways to prove your choice is the best and perfect. But in reality nothing is perfect. Everything has it's flaws and strengths. Fools like you won't accept the reality. Because you like one of the usual blind folded followers, who has no self-sense, like a frog in a well. You asked what makes windows phone OS better than other OS. So I said it's speed. With the perfect scenario to test that yourself. Now you come up with some useless example like TV or something. you understand what the F*** you are talking about. First try to respect everything. Don't hate something because you don't own it. Who knows it may be better than what you have. First untie your blindfold. Don't reply me. I have better things to do here than argue with an A** following, senseless fanboy. Accept reality of what? That I have a great phone that runs smoothly, doesnt crash and does everything that I want it to do? Again, I own this phone. I would know if runs smoothly or not. If its quick or not or what its capable of. You insult me and that makes your right? I can call you a bunch of names and that would do nothing. Are we going to make this a name calling contest???? What am I blind of? Out of 4 Android phones in the past 2 years have all run smoothly and that is the reason why I have stuck with Android. Its a great open OS that runs just fine. People tend to take things over board a whole damn lot. ONCE AGAIN. Windows and Android are great OS. But to call one better than the other is pretty stupid because its all about choice. They currently offer most of the same features, but of some that are better on Android that I prefer BECAUSE I WANT IT. That doesnt make me stupid or a moron. I ALSO NEVER SAID ANDROID WAS PERFECT AND I NEVER TRIED TO WIN YOU OVER. READ POST 78. Even if it was a stupid example. I tried to make it simple for you, but here it goes. My GS3 has MANY times more animations than over any Lumia. My GS3 has the same processor, so you might see 1/10th of an already FAST transition of what you CALL SLOW. I can also choose to turn it off and go into the developer options and turn any animations and transitions off and make these transitions intant or I can choose to kill apps if I leave them... I choose not to because I like my animations. ITS WHAT I PREFER! The main difference between this Lumia 920 and my US GS3 is that I have twice the RAM, so I can run a whole lot more than a Lumia 920 and it doesnt even slow down. So, again for the (x) time, IT COMES DOWN TO WHAT YOU WANT! I agree with you about everything. Although IOS is not optimized at all. It is JUST so simple, too simple that it doesnt need anything. Thats why its also 1st in aging pipeline. Using IOS feels like playing with dublo bricks, instead of real legos! I think you are confused the word "Optimization" with the word "Conservatism / Evolution". iOS = I will give number one place for Optimization. WP will only come second in this category even though the difference won't be that much. One good example for it is, it's battery life. iPhone and iPad has great battery life, while maintaining smoothness. But it's at the bottom when it comes to "Evolution". They are being too stubborn to change. WP => It's on top when it comes to "Evolution". (Look at the change (UI) from WM6.5 => WP7 => WP8) They also continue this trend in PC OS too. Optimization is also at the top just below iOS. Android => It's at the bottom, when it comes to "Optimization" But takes second spot when it comes to "Evolution". It's changes way from 1.0 to 4.2 is acceptable. Speaking from my 7 months of experience with my Lumia 900, and years of use of Android, Symbian, and others, allow mr to share my thoughts/experiences: Regarding Windows Phone: • It makes customization less necessary due to its ease-of-use and more modernistic interface (UI) which accomplishes natively what typically requires a third party app, widget, or macro to accomplish on other platforms, creating a satisfying and even PLEASANT user experience. •It. Just. Works. • The apps are top-notch, and without a bunch of junk trying to hog all the resources in the background (or poorly-written apps trying to hit the foreground), crashes are extremely rare (maybe once a month, but the system goes right to the Start screen), and 0 (yes, ZERO) force-restarts. The system shows it ls optimizations, cleverness, and straightforward simplicity at every turn. • Microsoft's app design guidelines are excellent for making everything, even third-party apps, feel unified, as well as quelling the riot of designs and styles prevalent on other platforms. Someone here recently mentioned that some apps on other systems (and the systems themselves) have a "MySpace" feel, being chaotic, unrefined, and unpleasant. This sentiment is not unrealistic. • Being of a smaller user base, there is a sense of tight-knit community of users, as well as being less-likely targets of malware and such (much like macintosh was in the early 90's) due to the relatively low user count. Also, Microsoft is good about patrolling, auditing, and stripping nefarious apps from the marketplace, if they get there at all. Much like google back in pre 2.3 days, when there were a smaller number of apps to patrol. • There is also a sense of being ahead of the curve, early-adopter status, if you will, being part of something that's great and becoming more widespread, much like Facebook when it was college-only. It isn't a selfish or haughty feeling, just one of satisfaction knowing you have something before others do. • The phones themselves are great. While android is beating them on specs, the phones still keep up with speed and fluidity. There isn't as much of a need for such potency, except for only top-tier games, and even then such astronomical hardware is overkill. Top-quality phones nonetheless, I.e. ATIV S is essentially a reskinned GS3, WP8X essentially a reskinned OneX, etc. There is also a strong innovative attitude, debuting novel concepts and technologies in phones rather than the constant game of one-upmanship prevalent on other systems. • I know I mentioned this earlier, but I must reiterate, the phones just WORK, and not only that, are even pleasant to use. This Lumia is THE most satisfying phone I have yet owned, period, and the only reason I want to replace it is that its younger sibling, the 920, is so much more improved in areas I frequently use and would use more with such an excellent device. Regarding Android: •Extremely capable. •Lots of options for phone sizes, types, and customization. •Lots of other users, with a large network of communities dedicated to ekeing as much out of each decent model as possible However... •it has a steep-ish learning curve •it can be chaotic and messy, and mostly due to its almost overwhelming customization options. •phone models are frequently replaced with newer models, so they lose value more quickly, and the user is filled with a constant desire to get the next thing, even if what they have was top tier previously. This creates a difficulty as few users can afford a new model every few months, and carriers only allow upgrading every 18-22 months. Also, there are those that upgrade because they are hoping that the new release night fix the issues they experience on their owned models, bringing me to... •there is such a frenzied pace to update models they can come out seemingly half-baked, unpolished, and incomplete. Thus the user has to wait for updates with the hope and expectation that those issues will be fixed. However the manufacturer is typically working on the next release, and the old model is old news and if and when the update comes out, it, too, can be seemingly incomplete and doesn't resolve the original issues. Thus, the customer is kept waiting for the next model with the hope that maybe it, finally, will be near-perfect in launch form. But the cycle continues. It is vicious and unsatisfying, and frustrating. • App developers seem to write most of the decent apps for the top-level devices, and any device that tries to use them less than top-end tends to be overwhelmed, so the app runs poorly, the device fails, and the user is frustrated. Similarly, it seems most apps aren't really written with restraint, that is, taking too much processing power on both front and backgrounds. The phone runs slowly, the processor gets hot, the battery life decreases dramatically (so if/when troubleshooting, the first steps tend to be resetting the device to factory-fresh), and the user gets frustrated. Noticing a pattern? It's like buying a car from a particular brand, having it fail repeatedly, but buying the same model a model year newer /ad infinitum/. Granted, some phones are better/worse than others, but I've seen this even with users of the Galaxy S3, Note 2, Nexus4/Optimus G, and a OneX+. •The system itself can lag and crash, even with Jelly Bean, not because it is a bad system, but because the system runs on top of an outdated Java virtual machine setup, which is in dire need of an overhaul, or the system made to run without the VM. Realistically this should be done within the next 2-3 updates to stay abreast of specs, cost, and user satisfaction/retention, despite recent improvements (octa-cores, more advanced GPUs, etc). •The not-infrequent freezes, page, restarts of both launcher and device, are frustrating, time-wasting, and are indicative of a flawed product. Android deserves better. You do realize that a lot of the problems you mention are probably with the phones and not the OS. My GS3 runs perfectly. I have not had to force restart even once and my phone runs perfectly. Sometimes I run into problems with certain apps, but thats the developers fault, NOT the phone, NOT the OS. Of course the developers focus on the top notch phones. I would expect them to or they would get many complaints about why they dont support 1080p, etc... if its already available. Windows doesnt have too many phones out right now and youre judging based on their Lumia phones. Once those Lumias start getting older, you have to reach a wider audience because technology advances at a very very fast rate. So, even if you have a top notch Android or Windows phone, it wont be for long. Its just the way it is and you will start running into compatability issues. Obviously when the original droid came out, it was a lot easier to develop. Windows is VERY new. This is why the iPhone is so stable because they worry about one phone only and its really easy to control the updates and software compatability. It might be similar to Windows because Windows wont be running skins. I like and prefer Samsung and Motorola skins over the stock OS. Some prefer the naked Nexus. We have a choice and Windows only has a phone choice. Its all about preference. Would I buy a Windows phone? Probably. Would I buy an iPhone? Probably not because I dont like Apples business strategies and I do not support them. It all comes down to the user. I like the extra stuff my GS3 does. The rippling water animations when I touch the screen, the developer options that let me make my phone snappier or prettier, the way I can watch a video while I text or read this comment, the way I can change the fonts, colors, widgets, settings, etc... I can even replace and create my own OS! This is why I like Android. Because I can root my phone and some manufactuers even condone it! I love my Android phone because I can make it do exactly what I want it to do and Android is cool with that. well, i think it's alright. even if android need higher spec, as long as that android phone run well, we should be gratefull. we shouldn't hate other OS, android is nice too, while my self loves windows phone more. ^^ cheers. sorry for the bad english though. if you guys says its worthy then its got to be true! There's one big difference: Droid was successful BECAUSE of Android, while 920 sells IN SPITE of WP8.